Hey Mom.....stop reading this right now. Really. Just click that little "x" button because I can tell you that you aren't going to like what I am about to say. It might even make you hyperventilate and create some paranoia issues. Who out there in blogland has a tat? Where did you place it? Does it have meaning to you, or is it just a friggin' rad design you loved? On a scale of 1 to 10, how much did it hurt? Will my mom disinherit me if I get one? Probably. Moving to Austin finally "allowed" me to fulfill my tattoo wish...this town DOES help encourage one if they are on the fence :). Mine is on the inside of my left arm. An enso (this: http://4.bp.blogspot.com/-_IC-nuLm_fM/T7J3uackhRI/AAAAAAAADLw/1srese0hgGc/s1600/enso.gif ) to help me remember that being imperfect is a natural part of life. More on the meaning, here: http://en.wikipedia.org/wiki/Ensō . I'll leave you with this: "do it if you're cool, do it if you're cool". Will answer some of your questions:who out there in blogland has a tat? I have one Tattoo. Where did you place it? Unfortunatelly, I placed it on my lower back. I was 17 and I am brazilian, the so called "tramp stamp" is not known there and I had no idea I would be looked at that way. :(Thats one of the reasons I regret doing it. When did you get it? Like i said, i was 17, so 7 years ago. Does it have meaning to you, or is it just a friggin' rad design you loved? When I was 15, my friends and I saw a runway model with it and we all loved it. We said whoever did it first the others would not do it.SO i did mine first. I had second thoughts the next day after getting it done. :( My mom let me do it because I said it was going to be small which it was. Sometimes I wish she had said no. On a scale of 1 to 10, how much did it hurt? it hurt a bit-7? the tattoo artist said that man usually feel the pain alot more. and that there are parts that hurts more like your ribs. Today Iam very counscious of clothes that show it like shorter shirts or bikinis specially when there is older people around me. I feel like people may judge me for having a tattoo in that place so I rather not show it. And one day i plan on removing it. Hope that helps, make sure u REALLY love it. The background about it is that my mom and dad went to Germany and Austria when my sister and I were pretty young. My mom brought us back these pretty necklaces with edelweiss flowers on them (pronounced adelvice). I fell in love with the flower as well as the song my mom sang to us (called Edelweiss). I started drawing the flowers in a pretty design my freshman year of college and just kept it in my wallet, adding little details to it now and then. I took french for almost six years and loved the saying "que sera, sera" as well as the song (Que Sera, Sera) [what will be, will be] so I added that in as well. I drew three flowers (one for me, my sister, and my mom in varying sizes) and then wrote the saying in a ribbon "tying us all together" to represent my dad. Randomly one day I decided to just do it! So I made an appointment, grabbed my boyfriend, and did it! It's completely based off of my own personal drawing. On a scale of 1 to 10, it hurt an 8.5 which is the main reason I don't want to get another one! There are definitely days I semi-regret it because I feel like people judge me for having one, but the majority of the time I love it and sneak a peek at it whenever I can! It's beautiful, intricately done, and the perfect size. And it means so much to me. you torture me.seriously.why don't you just buy some guns while you're at it. Haaaaaaaaa!!!! if that is really your mom, that is awesome. Ummm... 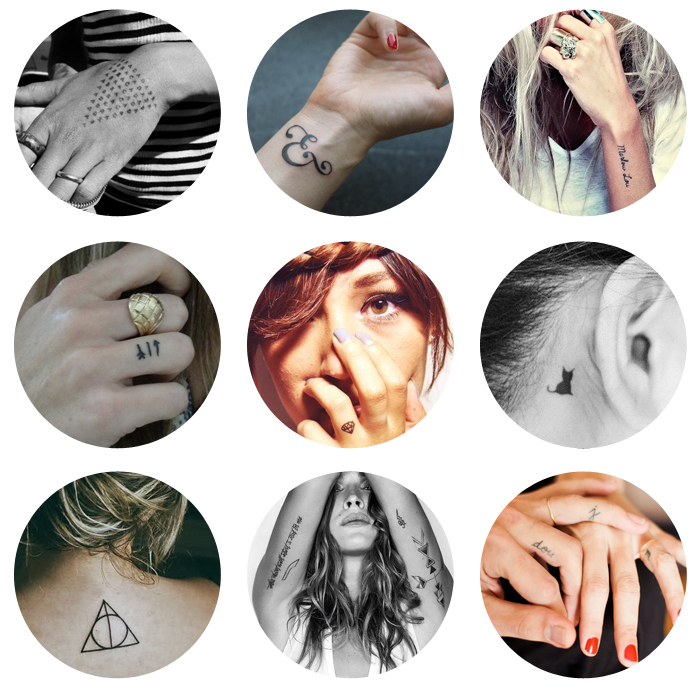 I also want a small tattoo, but haven't been able to commit to one. The only things I love enough to tattoo on myself are the Texas Longhorns and Texas. hmm..
Love this post. I am exactly the same! My poor mother...I want one so badly though. Looking for a tiny one too...love them on the wrist, even inside of fingers. How to choose?! Love this post! I have 2 tattoos and will be getting more! these are so cool, unique. I wish i had the courage to get one! I am the worst person to ask because I have 5 and counting! Once I got my first one I had to keep going. So get ready, you'll catch the tattoo bug! I'm looking forward to my next one which I'll be getting when I travel to Thailand. Best souvenir ever! Both my tattoos are pretty small (they only took about 15 minutes each) and yes, it did hurt. The one on my ankle, near the bone, hurt a lot more than the fleshy back, but it's really not unbearable. I'm a huge baby when it comes to pain and blood and needles - seriously, I pass out nearly every time I have blood drawn - but it's really a piece of cake (I'd say a 6 or 7 out of 10). Be more scared about the permanence than the pain. And it is true - they are terribly addictive. Just make sure you find a good artist (look at their drawings, not just tattoo books) and find a design you think you'll want to live with for a long time. Good luck! T.A. is looking forward to you coming to your meeting today. These picture are PRECISELY the type of tattoos I like. Small, no color, etc. I know Urban Outfitters sells henna kits. (At least they did last time I was there.) You could maybe practice with the henna to get a feel for placement, design, etc. Kinda like a mock up. Keep me in the loop of what you do! ME! ha I have a couple. I think the ones you posted pics of are beautiful. I love the tiny ones that aren't even noticed. I have one that starts below my neck and goes down my spine and ends with a tramp stamp! It super duper hurt being that it was on my spine, but well worth the pain. The meaning behind is much more than I can ask for. There's one big plumeria at the top which has our traditional design in each pedal, and it winds down with three smaller plumerias which represent my parents and my stop mom who have been a significant part of my life! Saw your post and for what it's worth, wanted to share my mom's story. My mom was 27 when she got her first tattoo. I can remember my four-year-old self going with her to have it done. After a few hours, we emerged from the tattoo parlor on Guadalupe and a blue crescent moon slept peacefully on the inside of my mom's ankle. Come to find out, she had waited over three years to get this tattoo; she knew she wanted this little moon but she wanted to be absolutely sure she'd love it forever. Fast-forward 24 years and she has decided that she's not into it. Bottom line: she's tired of having a tattoo. Even after three years of patiently waiting to make sure her ultimate design was indeed something she could sport for life, she found that she just couldn't predict that far into the future for something like that. My mom tried to have it removed but after three sessions of painful laser removal, the tattoo remains untarnished and as bright as the day she got it (thanks to years of wearing sunscreen). After all that, she's thankful for two things: that she placed her tattoo in an inconspicuous place and that it's a simple design. That's my mom's tattoo story. Again, simply food for thought! I have a small black tattoo on my wrist (interior face). I did it last year in NYC. On a scale of 1 to 10, I would like to say 3. But it depends on the person and where you do it.